I have sold a property at 101 1331 ALBERNI ST in Vancouver. LUXURIOUS TWO BEDROOM plus OFFICE with FANTASTIC OUTDOOR SPACE, UNIQUE IN DOWNTOWN VANCOUVER. Features SLEEK MODERN KITCHEN, Separated Bedrooms, Custom Built In Murphy Bed, Easy Access to Patio & Common Yard...PERFECT FOR PET OWNERS!...with Immediate Access to Outdoor Areas! Office has Thick Glass Door for Extra Light. THE LIONS TOWERS are situated on the Coal Harbour/West End Boundary with Convenient Access to The Seawall, Bike Paths, The Marina and Stanley Park. Concierge, Fully Equipped Gym, Media Room, Recreation Room with Pool Tables and Private Guest Suites. Close to Shopping, Restaurants and Transit. One Parking and Large Separate Locker Included. Must be Seen to be Appreciated! OPEN HOUSE NOV 30, Sunday from 1-3. VANCOUVER, B.C. – December 2, 2014 – Home buyers in Metro Vancouver remained active in November, a month that is traditionally a quieter time of year for real estate. The Real Estate Board of Greater Vancouver (REBGV) reports that residential property sales in Metro Vancouver reached 2,516 on the Multiple Listing Service® (MLS®) in November 2014. This represents an 8.4 percent increase compared to the 2,321 sales in November 2013, and a 17.7 percent decline compared to the 3,057 sales in October 2014. Last month’s sales were 6.9 percent above the 10-year sales average for November. New listings for detached, attached and apartment properties in Metro Vancouver* totalled 3,016 in November. This represents a 7.1 percent decrease compared to the 3,245 new listings in November 2013 and a 32.8 percent decline from the 4,487 new listings in October. The total number of properties currently listed for sale on the MLS® system in Metro Vancouver is 12,553, a 10.2 percent decline compared to November 2013 and a 9.4 percent decrease compared to October 2014. The MLS® Home Price Index composite benchmark price for all residential properties in Metro Vancouver is currently $637,300. This represents a 5.7 percent increase compared to November 2013. Sales of detached properties in November 2014 reached 1,012, an increase of 9.3 percent from the 926 detached sales recorded in November 2013, and a 60.9 percent increase from the 629 units sold in November 2012. The benchmark price for detached properties increased 7.9 percent from November 2013 to $997,800. Sales of apartment properties reached 1,052 in November 2014, an increase of 8.6 percent compared to the 969 sales in November 2013, and a 40.3 percent increase compared to the 750 sales in November 2012. The benchmark price of an apartment property increased 3.2 percent from November 2013 to $379,500. Attached property sales in November 2014 totalled 452, a 6.1 percent increase compared to the 426 sales in November 2013, and a 47.2 percent increase over the 307 attached properties sold in November 2012. 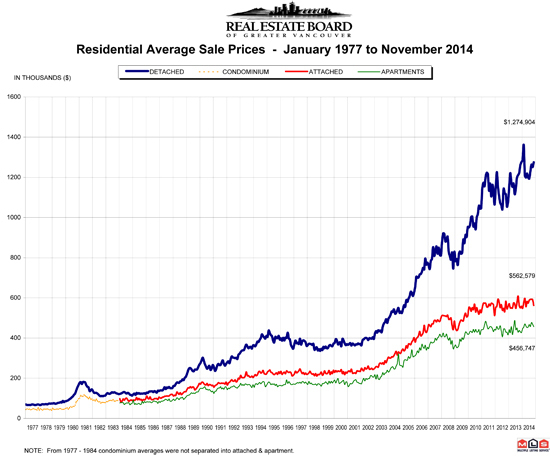 The benchmark price of an attached unit increased 4.8 percent between November 2013 and 2014 to $480,200.